Postdoctoral dental applications will require you to submit a host of documents including the perfect personal statement. Because of the high caliber of most applicants and the limited number of places available you will find that your personal statement will be a vital part of that application. Written well, a PASS ADEA personal statement will be capable of getting you noticed by the committee and in helping you to be selected for the place that you are targeting. It needs to cover everything that the committee wants to know in a way that is going to be able to sell you fully to them in a very persuasive way. Writing that engaging and effective personal statement as part of your application is however not going to be easy. This is why so many applicants will come to us for help in getting an edge with their application. Our professional personal statement writing and editing services can help you to submit an effective application that may help you to win that all important place. After uploading all of the required information you will then be able to search through the available programs and apply to those that you want. Ensure that you check each that you apply to in case they have supplementary information that they will want. Our postdoctoral application support service is able to provide you with a high level of support as we only work with true experts. You will always get to work with someone that is qualified with a post-graduate degree in a relevant area of dentistry as well as many years of experience with the writing of application documents at this level. They will fully understand the application process and what the committee will be looking for. Their writing skills are such that they can help you to craft a personal statement that will be highly engaging and written in perfect English throughout. Here are tips for writing AADSAS ADEA personal statement that you are looking for. A personal statement is exactly that; personal to you. It must reflect who you are and what your future plans may be in a way that will match with the expectations of the program that you are applying to. This means that your statement must be written from scratch at all times and only contain your information. Our experts, therefore, work directly with you to be able to draw out the best information to impress the committee with. Their writing skills will ensure that it will be able to sell your abilities and show that you are an ideal candidate for their program. The draft is always completed to your requirements with your details and you should then review it carefully. If you want any changes then our specialists will provide an unlimited number until you are fully satisfied with how your dental personal statement reads. Making a submission that will be able to get you noticed is easy with the help of our specialists. They work with you directly and will make unlimited revisions until you are fully satisfied that your personal statement and other application requirements are ready for submission. Everything that we provide is delivered on time and covered through our money back full satisfaction guarantees. We also fully test everything for plagiarism and proofread all writing so that you can be sure your statement will be error free. 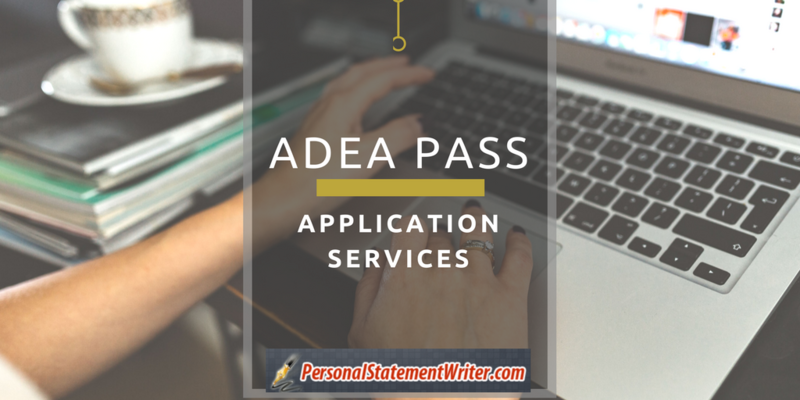 To boost your chances of a successful application use our professional help for your PASS ADEA personal statement writing and editing.